FTF and FamilySkiHub.com offer tips on how to still enjoy the great family sport of skiing in a down economy, with some resort suggestions. You don’t have to search long to find headlines bemoaning the economy. It seems as if everything from unemployment to the stock market is going the wrong way on a daily basis. 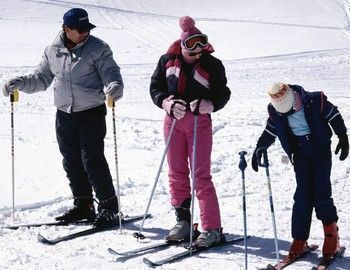 So, where can you manage expenses and still have a great ski trip? Most North American ski resorts reported double-digit declines in visitors last season. A Colorado ski trade group recently announced that through December, 2008, bookings were down 14% from last year. If there is one advantage that a budget-strapped traveler has, it is that the resorts want you this year, like never before. That should mean aggressive pricing and potential freebies, but most are offered on a case-by-case basis and vary depending on the week. We’re seeing more “kids ski free” and discounts on multi-day passes than in years past. While many great family resorts like Big Sky in Montana and Steamboat in Colorado have always had deals for kids, it is a trend catching on among the western destinations. Also, check with your lodging operator, whether it is the resort or a property manager, about potential lodging/lift discounts. They appear to be more prevalent this season. Most family ski lodging nowadays comes in the form of condos. That means you’ll have a kitchen, and that means you can cook. You don’t even have to get a pan dirty. Get cold cereal and OJ for breakfasts, and pasta or sandwiches and fruit for dinners, and you’ll save money without much work. We all know that after a long day of skiing, the troops will eat just about anything and be satisfied. Most ski areas have some type of transit system and many, like Steamboat and Aspen, offer free shuttles to get around town. Our resort reviews help you determine where you might need a car and where you won’t, but more often you won’t. We would note that while intra-city transit is becoming more common, you typically incur a cost to get to/from the airport (and it can be high in some places). Check out the “Travel: Airport-to-Slope” feature on familyskihub.com for more information. Face it – many kids or family skiers only have a half-day of fun skiing in them. After that, the legs burn and fatigue sets in. Keep it fun. Ski a half day, and then shop, or play Wii, or do something fun. This is vacation, not boot camp. If renting equipment, you probably don’t need the high performance skis. Most of us get along just fine in the standard issue skis, and there is often a “sport” choice that lies somewhere in between. The quality of your quads is more important than the quality of your skis. With that said, be assertive about returning your skis for a different pair if they don’t feel right. The authors rarely go an entire ski trip without someone swapping out skis for a different set, and ski shops will almost always gladly oblige. And speaking of skis, make sure you price them in the off-resort locations. Getting skis at Gart Sports in Denver, as one example, will save you significant cost versus renting after you’ve arrived at the mountain. For every ritzy, expensive resort, there is a less expensive alternative nearby. 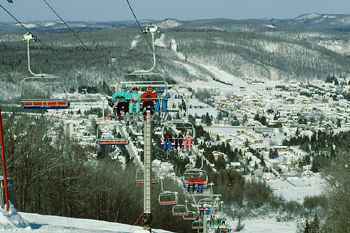 While the alternate resorts may not have the same “it” factor, they often have similar skiing. With expensive Jackson Hole, there is the great alternative of Grand Targhee. For Big Sky, it is Bridger Bowl. Aspen has several resorts nearby that offer cheaper lodging and lifts. As with any vacation, it is all about prioritization. Conspicuously absent from this list is lodging — we feel that a place to not skimp is lodging, both in terms of convenience and quality of accommodations — but that could also be a price lever for you. In short, determine what is important to you, and don’t skimp on it. For everything else, let the deals begin! and make your own lunches! We always bring sandwiches, apples, bananas and cookies and take a break for lunch #1. Then we stop again in the afternoon for a hot chocolate and snack in the snack bar to fuel us 'til the lifts close. I've even skied with plastic sandwich boxes in my backpack, but that does get a little bulky on the chairlift!